When you’re looking at the curb appeal, the 2016 Honda Civic is a compact sedan that looks much more reliable than the Toyota Corolla. Now, the Corolla seems a little sleeker than the Civic, but manufacturers wanted a safer look for consumers. Oh, and for those of you who worry about horsepower, the Civic has 143hp. I wouldn’t consider that high performance vehicle by any means, but it will definitely get you where you want to go, and grab the attention of co-workers, friends, and even strangers. 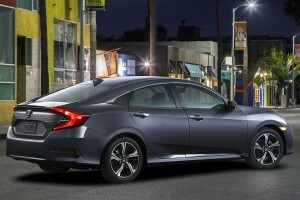 In the end, you can never go wrong with a Honda Civic. Originally I was going to provide you with 3 cars under $20,000, but this is by far one of the best choices on the market (in my opinion). Outside of my son’s Civic (because we’ve had less than 2 years), all the others latest 10+ years. Our grandmother drives the 1998 today, and it still purrs like a kitten. It’s a wise investment, especially if you’re looking for a compact vehicle. This entry was posted in Car Reviews and tagged 2016 Honda Civic. Bookmark the permalink.